NotRappaport » October 31st, 2017, 4:38 am wrote: Can we please get a moderator to weigh in on this? I say brianv is trolling and adding absolutely nothing of value to this thread. Can we have a moderator ban this liar? This contraption, whatever it really is, can be seen in the sky at its appointed times. I've seen it myself a few years ago, courtesy of learning to be able to do so from THIS very site. I was thinking of doing another viewing either Sunday morning or Monday morning, due to this reprised conversation. I forgot to get up early on either morning. Isn't there a saying that goes something like "Condemnation before investigation is the height of ignorance"? HonestlyNow » October 31st, 2017, 3:02 pm wrote: Hello, brianv. Couldn't have put it better meself! By her own admission she has never even seen a "shooting star"! Guff Warning To the naked eye it looks almost as bright as Venus but too small to see any detail beyond a bright point of light. Did you see an Orbiting Point of Light or a Free Falling Streak? Have you ever seen a "shooting star"? Imagine that, your ISS cheerleader has never seen a "shooting star". I take it she doesn't get out much...from the asylum. HonestlyNow » October 31st, 2017, 3:02 pm wrote: Isn't there a saying that goes something like "Condemnation before investigation is the height of ignorance"? I have never said anything to the effect that "shooting stars" don't exist or condemning anyone for saying they do. Your mendacity shows what a clueless, ignorant troll you are. It is a mystery why all your posts are not banished to the derailing room. NotRappaport » October 30th, 2017, 5:46 pm wrote: Note that I cut these out of their original images and condensed them all into a single image so as not to unnecessarily clutter the thread). Thanks, NRpt, that´s very considerate on your part. By any chance, you wouldn´t have saved the URLs where you found each of those six pictures? Some of the pictures had a very small image which I enlarged. Last edited by NotRappaport on Tue Oct 31, 2017 6:12 pm, edited 1 time in total. I'm surprised by the lack of moderation in this thread, I've had nothing but abuse and ad-homs from you. It might also surprise you to learn that I was instrumental in this site's creation! How can you claim to have seen the "ISS" if you have never seen a shooting star? You don't even have to look for them!! I asked my wife, "how many shooting stars have you seen", (she doesn't know a thing about "space fantasies"). "Oh dozens", she replied. Just in case you don't see it the "ISS" is Magenta coded. 25000km/h, 150 times the speed of a bullet, 1/15 of a second. I was right!! brianv » October 31st, 2017, 10:36 am wrote: It might also surprise you to learn that I was instrumental in this site's creation! If that's true, it is all the more tragic that you are now contributing to it's downfall with mindless trolling and idiocy. It seems you your presence here has long since outlived any semblance of usefulness. If you still cared about this forum you would leave the discussion instead of muddying it with your ignorance. brianv » October 31st, 2017, 11:05 am wrote: 1/15 of a second. I was right!! You are so hopelessly ignorant and wrong that you look like an absolute idiot to anyone who has taken the time to "spot the ISS". And because you cannot understand angle and velocity calculations, you can't even comprehend the proofs for how fast something travelling 27,580 km/h will appear to move across your field of view when you're watching it from more than 400km away. I have just wiped the floor with you and you come back with another ad-hom! Oh haha, watch how that little pink sucker go, it overtakes it's LEO neighbours, the Iridium and Hubble on every fifth or sixth orbit! Last edited by brianv on Tue Oct 31, 2017 6:42 pm, edited 1 time in total. Thanks for the links, NRpt. I will have a close look as soon as I find the time. NotRappaport » October 30th, 2017, 5:46 pm wrote: Given that it's path information is accurate and it's viewable times are known many days in advance, its very hard for me to imagine that - among all the people who take the time to regularly track and document it with magnified telescopic views - no one would notice if it didn't look like what we're told it looks like. 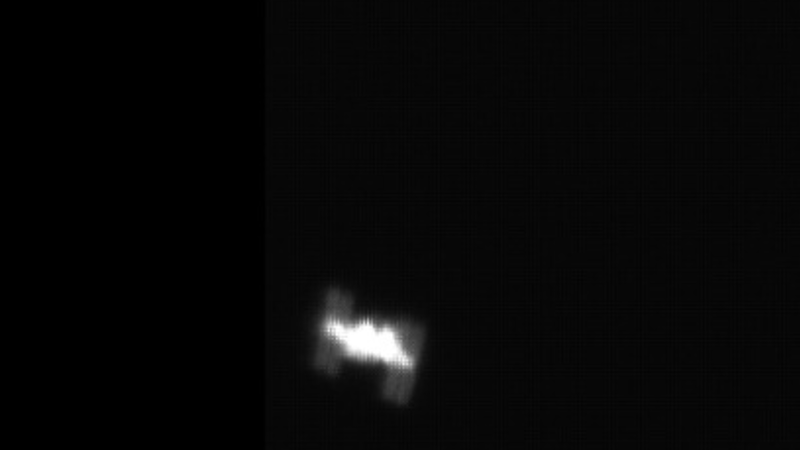 And it is equally hard for me to believe that every single person who submits images of the "ISS" to cloudynights.com and other astronomy forums is a hoaxster who no one among all rest of the stargazing enthusiasts ever call out as such. So from that I conclude that it almost certainly does look like what is shown in the images taken by people on the ground. More importantly, I know of no close-up images that don't show the same basic thing that all the other images show. 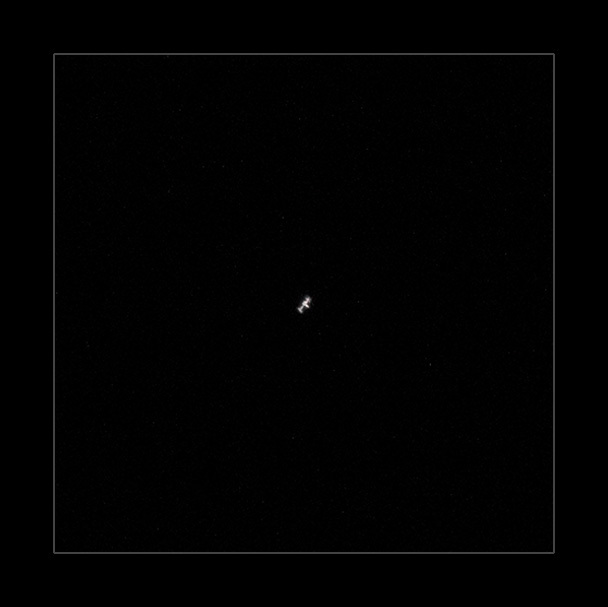 If there were people posting close-up images of the "ISS" that looked nothing like the typical image (in ways not explainable by exposure settings and light conditions) of the "ISS", for example showing only a big dot with no angular shapes or showing it was a plane... THEN I would consider that a genuine controversy and make a real effort to see it up close for myself and go through the bother of getting the telescope set up to try and accomplish this. It all sounds very reasonable, but the exact same arguments were used to sell the mass media narrative of the destruction of the WTC: "Think of all those people who documented the attack with their cameras ... wouldn´t they notice if their pictures looked different from the broadcasts? ... could every single person uploading their amateur pictures of the smoking towers possibly be a hoaxer? ... would no one call them out? ... the complete absence of alternative views of Manhattan proves the images of the collapsing towers are legit ..." and so forth. As we have seen over the years on this forum, these arguments depend on the passive acceptance of a number of false assumptions. In the case at hand, the critical point is in going from viewing "a bright spot" to viewing "a contraption", something you assume is not only possible, but easy. "it almost certainly does look like what is shown in the images taken by people on the ground. At least until I purchase a powerful telescope and become a stargazing enthusiast myself. Your failure to stay on the this thread's subject (the "ISS") is duly noted. Let's debunk you once again: Notice how fast the clock in the upper left hand corner of your animated orbits picture is moving? It looks to be going at about 1 hour per second, which means the animation is moving at about 3600x actual speed. Your posts clearly have no purpose besides trolling. NotRappaport » October 31st, 2017, 7:46 pm wrote: Your failure to stay on the this thread's subject (the "ISS") is duly noted. Which means the Earth is rotating @ 3600 times it's actual speed too! I must agree with Flabbergasted when he states that the abundance of amateur photography of the claimed "ISS" is in no way evidence of its shape and design. Especially, when one considers just how powerful a telescope one would need to take such a picture, upwards of 100x zoom and the extreme difficulty, if not impossibility, of managing to capture an object moving between .3 and 1 degrees per second in the night sky in such a close zoom. I am personally of the opinion that all of the amateur imagery except those of singular white dots and trail paths are fraud. 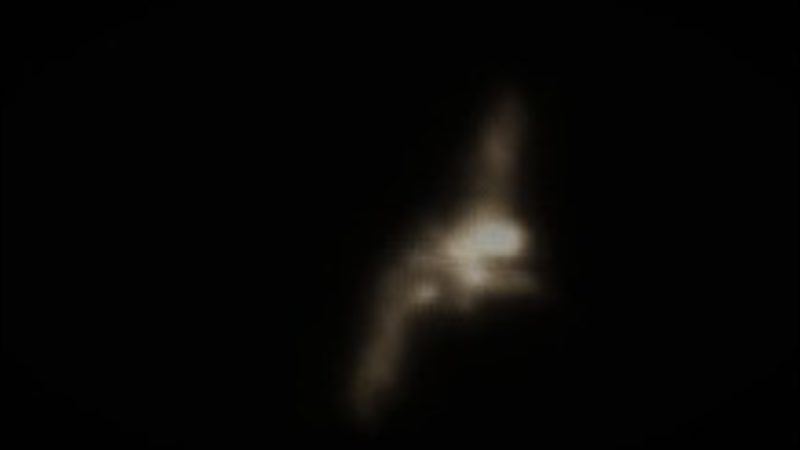 I have however, read a considerable amount of testimony which seemed to me authentic that upon observing this object with a binoculars or a spotter scope it does have a rectangular or "H" shape to it. I have not confirmed this claim for myself, but it would seem that this could be an instance of confirmation bias here among those who see this object in binoculars and see a vague shape to then make the perceptual leap to believing that what they saw actually resembled those fraudulent "amateur" close up pictures. One more point of note, I have noticed that almost all of the testimony I have read regarding the claimed "ISS" comes from people who have this very positive feeling about it. I have noticed a few consistent phrases in use: "there it was right on time" and "it just baffled me to think there are people living up there," I do not know if this is an indication such testimony is from a shill or if it is indicative of how hive-minded an disassociated such people are, but I do think it calls enough question into such testimony that independent verification of this object's shape is absolutely needed. Flabbergasted » October 31st, 2017, 11:41 am wrote: Thanks for the links, NRpt. I will have a close look as soon as I find the time. So from that I conclude that it almost certainly does look like what is shown in the images taken by people on the ground.More importantly, I know of no close-up images that don't show the same basic thing that all the other images show. 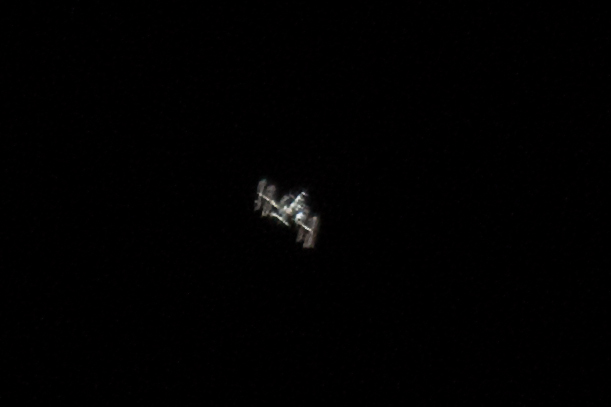 If there were people posting close-up images of the "ISS" that looked nothing like the typical image (in ways not explainable by exposure settings and light conditions) of the "ISS", for example showing only a big dot with no angular shapes or showing it was a plane... THEN I would consider that a genuine controversy and make a real effort to see it up close for myself and go through the bother of getting the telescope set up to try and accomplish this. No, this is very different because the 911 thing happened only once and there's no way to go back in time to take real pictures. The ISS flybys happen every day with announced predictability all over the world. There are unending opportunities to observe it and take more pictures. Flabbergasted » October 31st, 2017, 11:41 am wrote: In the case at hand, the critical point is in going from viewing "a bright spot" to viewing "a contraption", something you assume is not only possible, but easy. No, I don't assume it is "easy". It is not impossibly difficult, but it is far from "easy" because when you zoom in close enough to see details it is very difficult to keep the object in the frame due to it's velocity. Basically, think of the challenge of getting a close enough view of Saturn to see it's ring, then imagine that instead of moving at 15 arcseconds per second across the field of view, Saturn is moving 3600 arcseconds per second (this is how fast the ISS moves when it is closest, directly overhead) or around 1000 arcseconds per second (when it's moving along the horizon and far more distant). It can be done and it's not too difficult, but it's definitely not easy. 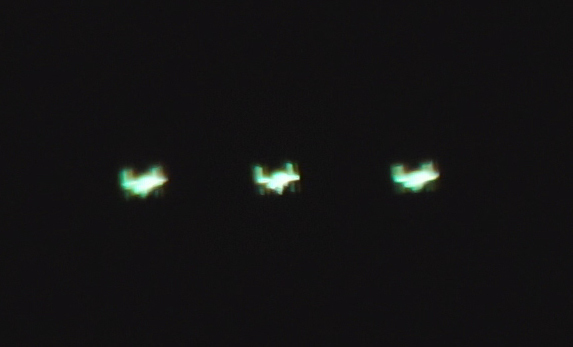 It is very very difficult to get a clear picture, but if you record a flyby with a high-zoom video camera with a 1 degree FOV (like the Coolpix P900 used for the "barbie" pics), there will probably (hopefully) be at least one or two frames that catch something resembling a blurred metallic contraption (most frames will be empty because of the difficulty of keeping it in-frame). Getting a clear picture typically requires a telescope with an attached hi-res, fast exposure (1/2500 second) camera taking many pictures per second and a custom mount that will make tracking it's path easier. And even then, you would have somewhat blurry individual pics, but because there will be many of them from the same angle they can be "stacked" using Photoshop or Lightroom type software to produce one clear image from a bunch of individual images that are not as clear. As I understand it, that's how the really clear images taken from the ground that show the solar panels and everything in relatively sharp detail are produced. 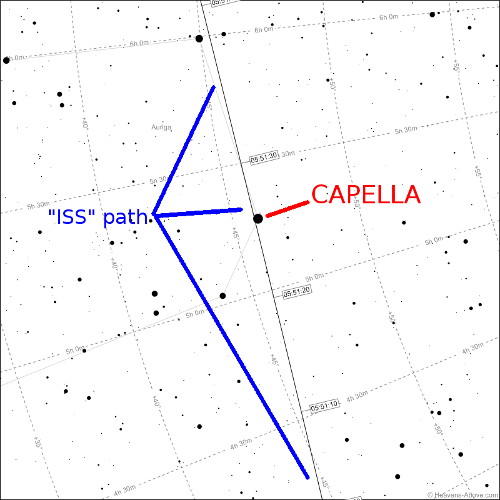 I've been looking at the upcoming "ISS" flybys and there is a very good one scheduled for November 16 during which the "ISS" will pass right next to the star Capella - a nice bright star that's easy to find. This will allow me to get the telescope set up aimed at that exact location a few minutes before the event and then I'll just switch the camera into video mode a few seconds before it comes into frame. This will avoid the necessity of trying to keep it in frame while tracking it across the sky and should produce a picture that shows what "IT" actually looks like. As far as settings, I intend to use ISO 1600 with an exposure time of 1/2000 second, but I'm going to research this more. I also need to tinker a bit and make sure the manual exposure settings carry over to video mode. I'm hoping for clear skies, but one way or another I'm going to eventually get a good look at that freaking thing in the sky!